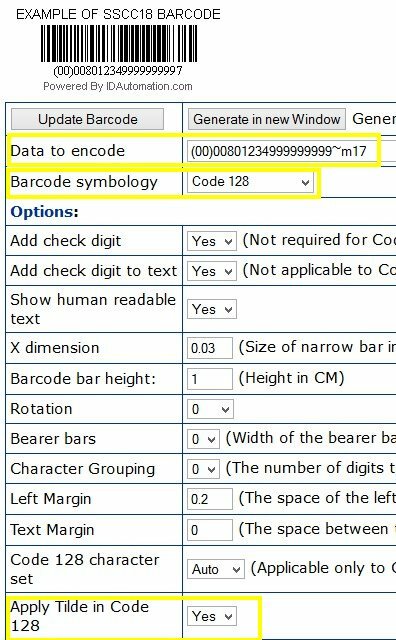 Can the Dynamic Barcode Generator Subscription create GS1 and SSCC18 barcodes? The Dynamic Barcode Generator Subscription and all other IDAutomation Web Components are capable of generating Code 128's SSCC18, SCC14, IMpb, GS1, and additional standards. 1. Enter the data. Because SSCC18 requires a MOD10, use ~m17 to calculate the check digit for 17 characters, excluding the Application Identifier. 2. Set the Symbology to Code 128. 3. Set ApplyTilde to Yes/True. NOTE: The example only shows how to generate a GS1/SCC18 standard barcode. It does not cover XDimension and Barcode Height required for the standard.